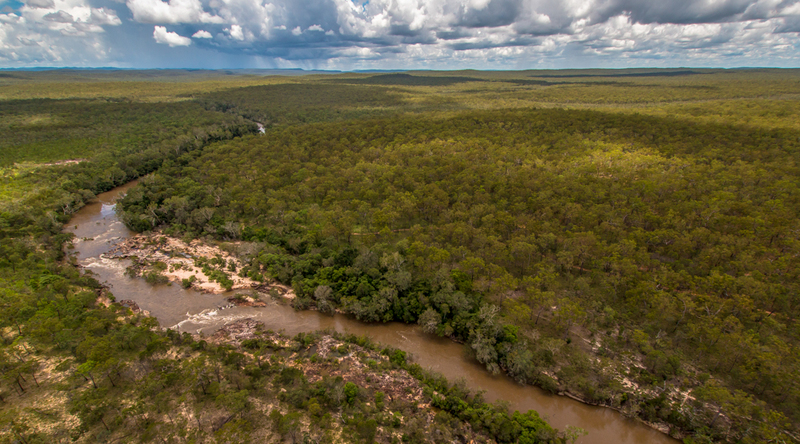 Piccaninny Plains lies in the heart of Cape York Peninsula, a region of global significance for conservation. 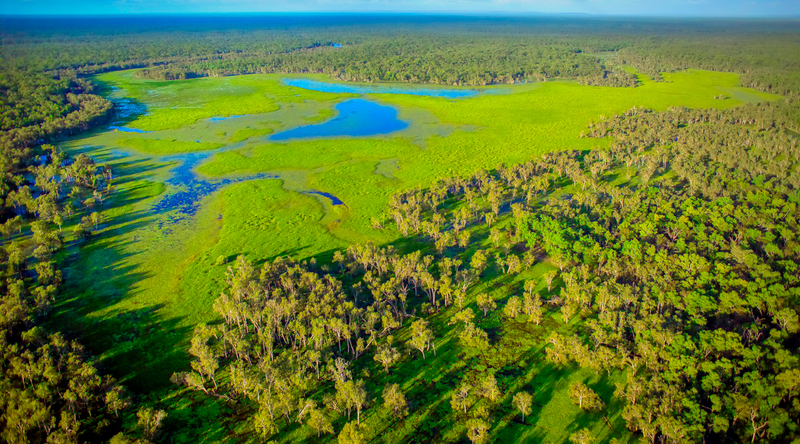 Covering almost 165,000 hectares, Piccaninny Plains is a property of stunning ecological diversity, protecting a mosaic of rainforests, woodlands, wetlands and grasslands and iconic wildlife like the Palm Cockatoo, Red Goshawk and Spotted Cuscus. Piccaninny Plains is jointly owned by AWC and The Tony & Lisette Lewis Foundation - WildlifeLink. AWC is responsible for delivering land management and science programs on the property. The partnership represents an exciting new model for collaboration in the private conservation sector in Australia. Cape York Peninsula has been connected to New Guinea for much of the last 250,000 years. The repeated exchange of flora and fauna has left behind a rich biological legacy. Piccaninny Plains protects an impressive representation of this evolutionary mix. Its woodlands are distinctly Australian, dominated by antipodean species such as eucalypts, acacias and kangaroos. In contrast, the rainforests that thread their way across the property have a strong New Guinean feel, supporting charismatic species like the Spotted Cuscus. 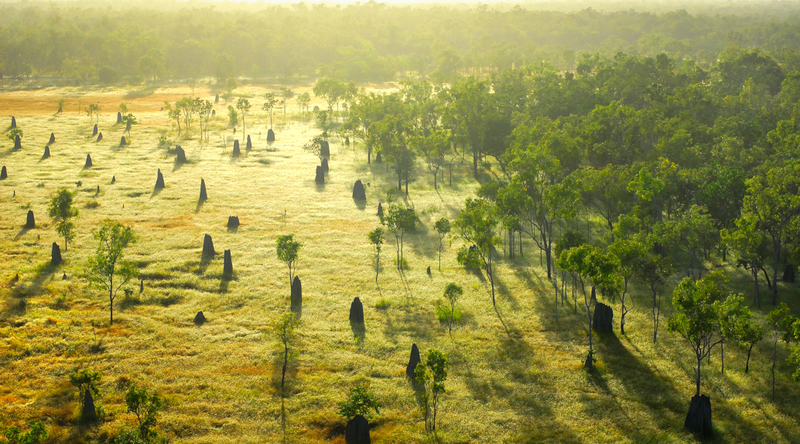 Situated in the centre of Cape York Peninsula, Piccaninny Plains extends from the foothills of the McIlwraith Range to the western plains of the Gulf of Carpentaria. 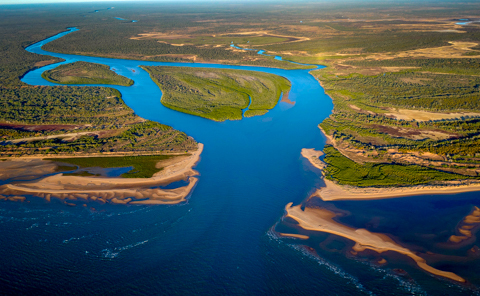 Fifty-two kilometres of the Archer River and its towering gallery forest form the southern boundary. 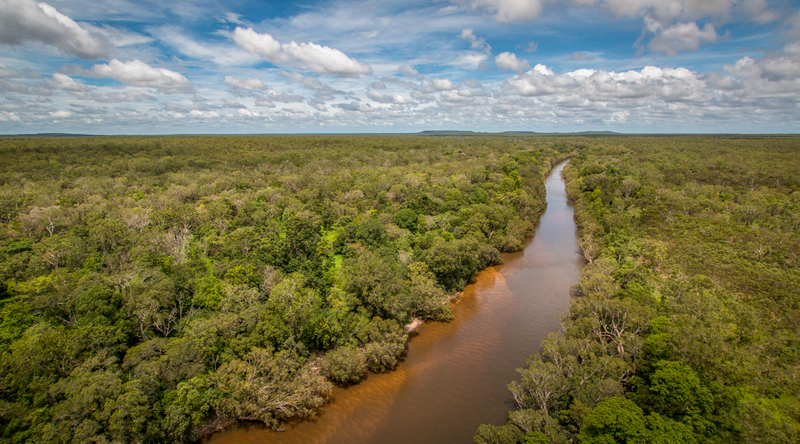 From here, a network of wetlands, woodlands, tall grasslands and deciduous vine forests extend 60 kilometres to the north, meeting the rainforests of the Wenlock River and the north eastern boundary. 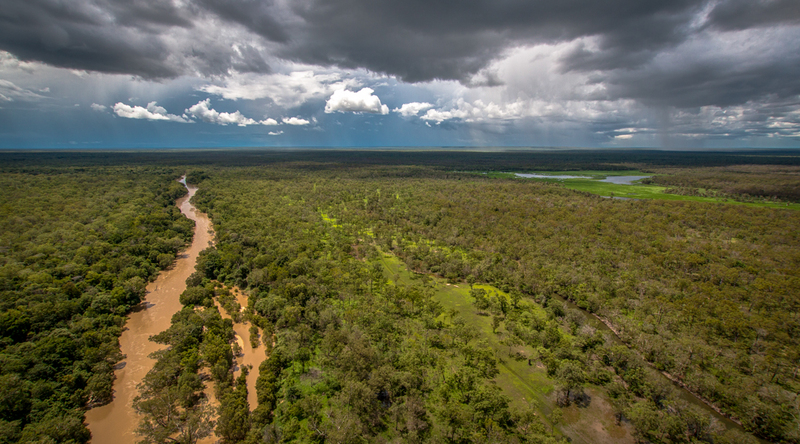 Piccaninny Plains is subject to the ‘wet’ and ‘dry’ seasons typical across northern Australia. In summer, monsoonal rains swell the rivers and creeks into a continuous expanse of water that spreads over hundreds of square kilometres, effectively cutting off access. Once the monsoon withdraws, the land becomes progressively drier with even the larger rivers receding to a steady trickle between a string of pools in wide sandy beds. Away from the waterways, deeply cracking clay soils underlie much of the property. Shallow depressions in the clay called “gilgai” retain water, and provide important habitat for months after the wet season. 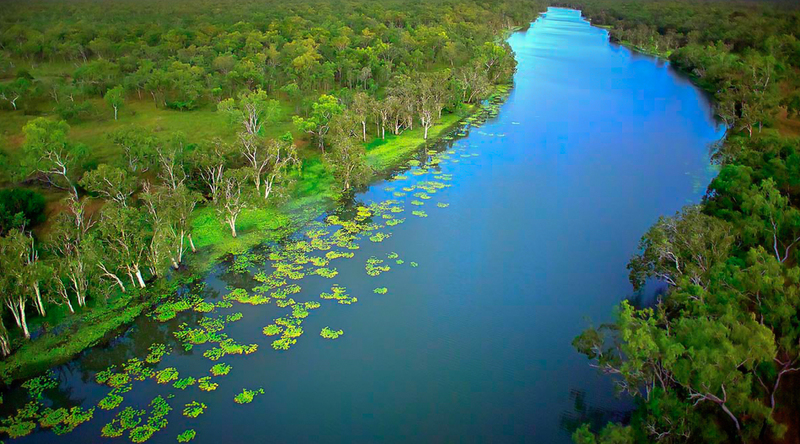 The sanctuary provides a critical corridor that helps link the east and west coasts of Cape York Peninsula. 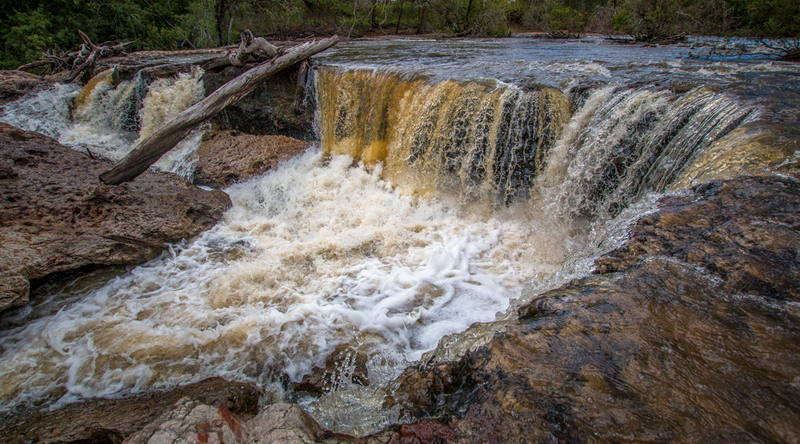 It contains stretches of two of Australia’s most important rivers (the Wenlock River boasts more fish species than any other in Australia) and supports the majority (in some cases the entirety) of several distinct ecosystem types. 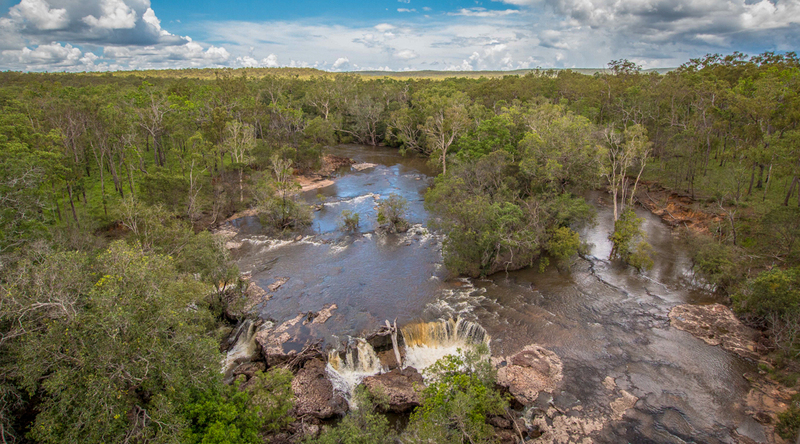 Among the magnificent gallery forests there is one rainforest type found nowhere else in the world, and the property contains the largest and most intact tropical grasslands in the high rainfall belt of northern Australia. These grasslands have been destroyed elsewhere by intensive grazing and cultivation. The combination of Australian and New Guinean wildlife explains why Piccaninny Plains supports such a diversity of species. In Australia, many of these animals are found only on Cape York Peninsula – like the Yellow-billed Kingfisher, Eclectus Parrot, Trumpet Manucode and Magnificent Riflebird. The open woodlands and grassland that cover the majority of the property are home to well over a hundred species of birds including seed-eating parrots, finches, quails and doves, insect-eating flycatchers, swallows, whistlers, wagtails, predatory raptors and owls, and many more. Reptiles abound in this habitat with many species of pythons, venomous snakes, skinks, geckos, dragon lizards and goannas. Mammals of these open woodlands include two (probably three) species of bandicoot, wallabies, possums, gliders, small carnivorous marsupials such as the Red-cheeked Dunnart, and native rodents such as the elusive Black-footed Tree Rat. The mammal fauna also feature some of the country’s rarest bats including the Papuan Sheath-tailed Bat and the Cape York Free-tailed Bat. 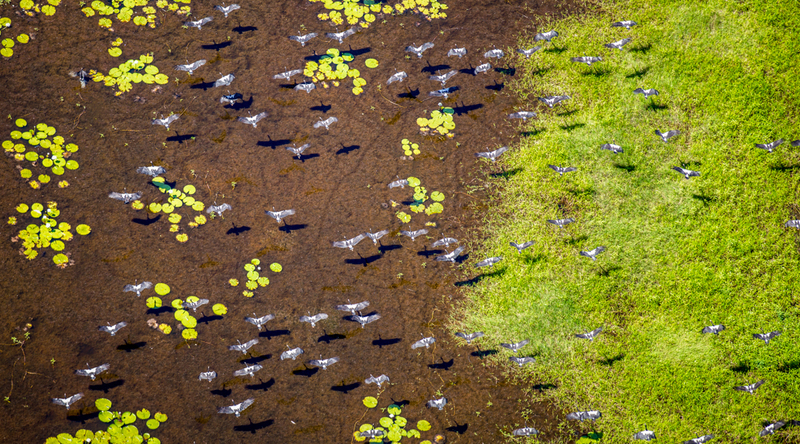 Piccaninny Plains contains a vast network of wetlands, providing a haven for resident and migratory waterbirds, fresh and saltwater crocodiles, aquatic snakes, over 20 species of frogs, freshwater crabs, 4 turtles and 30 species of fish. The Spotted Whistling Duck was a highlight of recent biological surveys. Gallery and vine forests are home to some of the sanctuary’s more striking wildlife, including the Spotted Cuscus, Striped Possum, Palm Cockatoo, Magnificent Riflebird, Eclectus Parrot, Amethystine Python and White-Lipped Tree Frog. These forests also contain some distinctive tree species, such as the towering Bamaga Satinash and Native Crepe Myrtle. 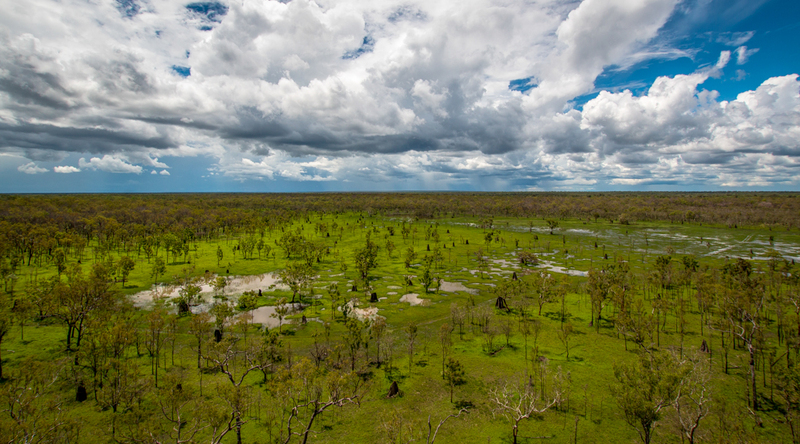 AWC’s active land management at Piccaninny Plains, with a strong focus on fire management and feral animal control, is playing a critical role in providing a secure future for the wildlife of Cape York. The survival of a suite of mammals that have severely declined across northern Australia (such as the Black-footed Tree-rat), demonstrates the integrity of the habitats on the property. Delivering fire management across a complex landscape, usually involving prescribed burning in the early dry season and, if required, fire suppression in the late dry. This limits the spread of intense late-season fires, and protects patches of crucial old-growth vegetation and fire-sensitive habitats. AWC’s fire management at Piccaninny Plains has substantially changed fire patterns across the property. For example, the extent of vegetation not subject to a late dry season fire for at least 3 years has increased from 5% in 2008 to 72% in 2017. Feral herbivore control. Feral horses, cattle and pigs are the most problematic feral herbivores on the property, and are being removed by trapping, mustering and shooting, as well as strategic fencing to limit reinvasion and protect wetlands. In 2016 alone, AWC removed nearly 2,500 large feral herbivores. In the last 5 years, field staff have removed over 6,000 pigs, 5,500 cattle, and over 900 horses. Feral pigs are the main problem on Piccaninny. They are incredibly destructive, and their effects are felt throughout the ecosystem. They damage wetlands and spoil the water (affecting fish populations), eat the eggs of emus, turtles and crocodiles, eat native mussels and land crabs, and impact on other ground dwelling wildlife like birds and goannas. Extensive biological survey activity. AWC’s science team measures a suite of ecological health indicators at Piccaninny Plains, through flora and fauna surveys, camera trapping, aerial surveys and wetland health assessments. Particular indicators of ecosystem health include the abundance and richness of small mammals and diurnal lizards, as these groups are highly responsive to habitat condition. Research at Piccaninny Plains is focused on assessing the impact of grazing by feral herbivores on native populations, by comparing matched survey sites in stocked and unstocked paddocks. Weed control. 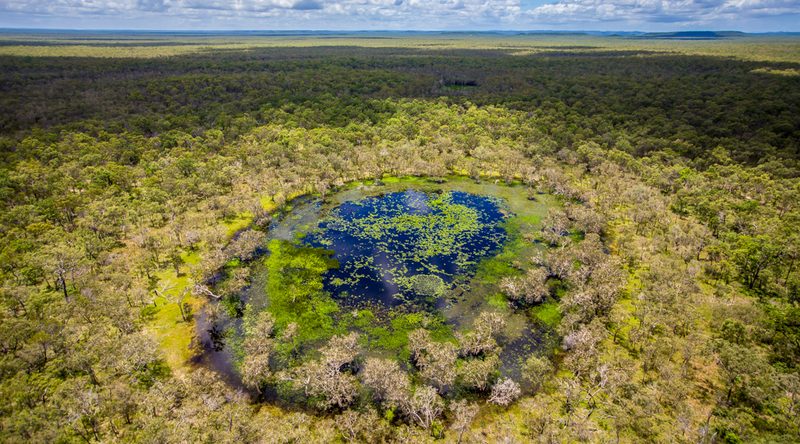 Piccaninny Plains remains relatively weed free thanks to its remote location and short pastoral history, however invasive weeds are having a major environmental impact across much of Cape York, and there are some species that still require management. Most have been significantly reduced through a program of spraying and slashing, and quarantine measures, such as vehicle wash down, are in place to limit their spread. Developing a strategy to limit the impact of feral cats, including detailed research on their hunting and habitat preferences, and targeted shooting around waterholes in the late dry season. Close to 200 cats have been removed from the property in the last 5 years. 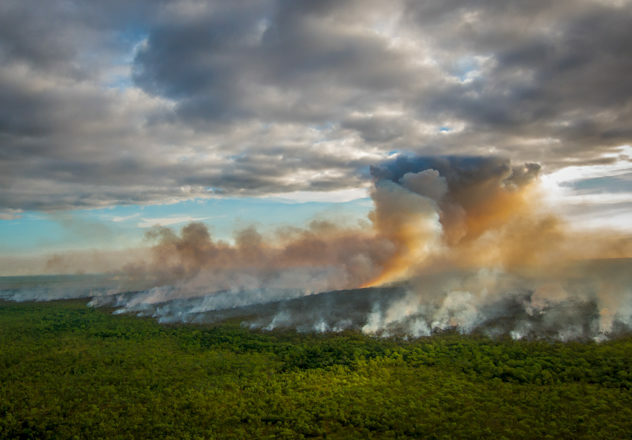 The primary threats to wildlife on Cape York are wildfire and feral herbivores, largely through the destruction of important habitat. Both of these threats exacerbate predation on small mammals by feral cats, and are the subject of ongoing research by AWC’s science team to develop the most effective management strategy. AWC has implemented fire management across Picaninny Plains to reduce the impact of hot late-season fires, and we are constantly removing pigs, cattle and horses from the property.